Began clapping on his own on jan 16. when he claps his hands his whole face just lights up when you start singing "patty cake, patty cake"
starting crawling on jan 18th and started pulling up on stuff immediately (only on his knees...not on his feet yet). after only a few days he was reaching up trying to open doors (not really 'trying'...but pulling himself up thinking he could reach the knob. started sitting up in his crib. and i think at first it took him a while to figure out how to get back down, but now i think he does just fine. we put the mattress down in crib not long after he started sitting up (on the 21st) because he was starting to then also pull up onto his knees....and i didn't want to chance him pulling himself to standing for the first time in his crib and tumble out. loves the nesting cups and gets so frustrated when he can't put the smaller one back in. i remember the girls liking these cups, too....but if memory serves....they just like pulling them out and clanking them together. but nolan actually wants to stack them inside one another. so neat to see. has starting exploring more and more. 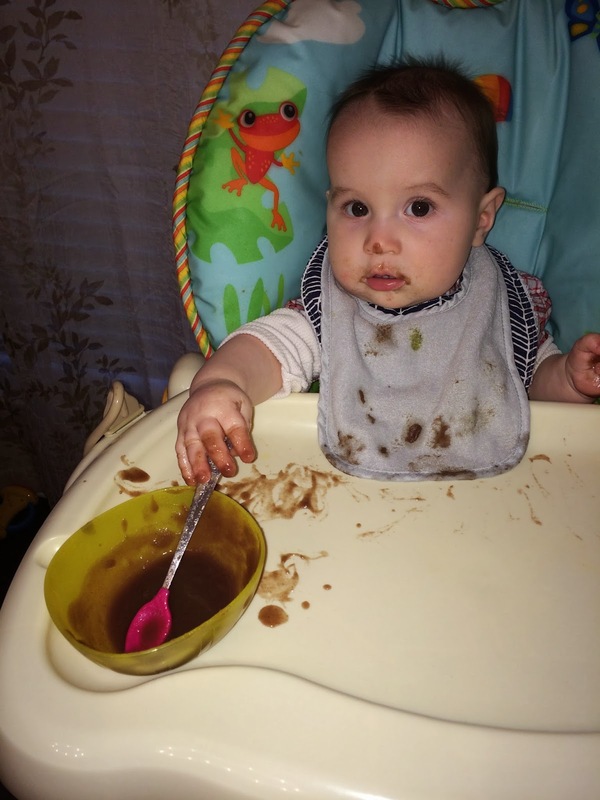 eats 7oz about every 4 hours; eats a 4oz jar of baby food in the evening. size 3 diapers. had to get nighttime diapers because they were leaking almost every. single. day. the pampers night time diapers work so well! 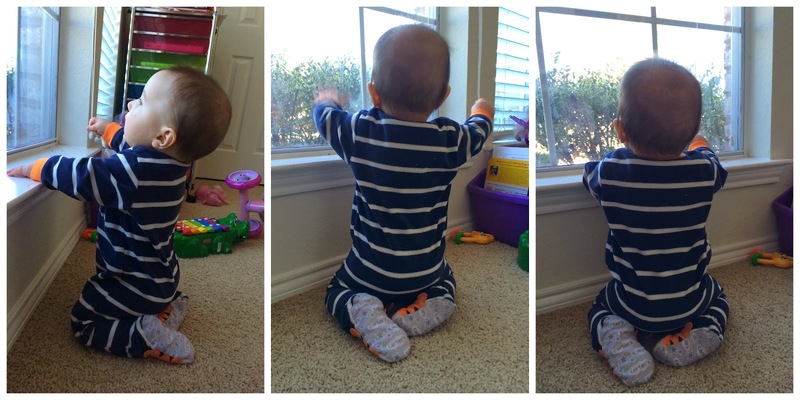 wears 6-12 month fleece sleepers every night (and most days, too, if it's really cold). can still fit into his 6-9 month clothes, but the pants are noticeably short and he is probably ready for 12 mo clothes. loves, loves, loves his sisters. so fun watching them all together. gives the sweetest slobbery-ist kisses around. rough time teething, bless his heart. his top right front tooth came in about midway through the month. i was up with him 4 times in the night. seemed like all night long! and while i thoroughly enjoy my sleep at night....i really treasure these moments that he just snuggles up to me. one day he'll be too big for my lap. 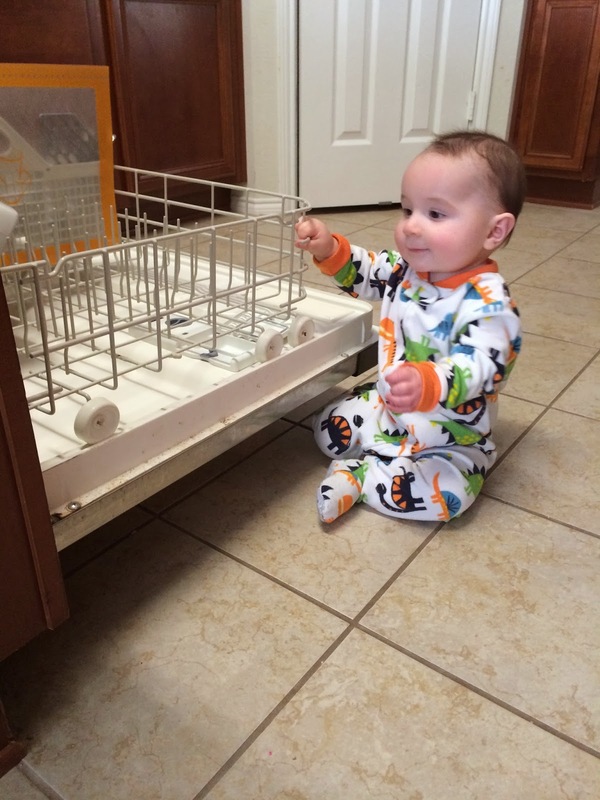 Basically the day he turned 9 months old he started saying 'babababababa.' And a couple of times he's said "mamamamama" and "dadadadada". But only accidentally. Haha! Even still....his voice is just so so sweet. 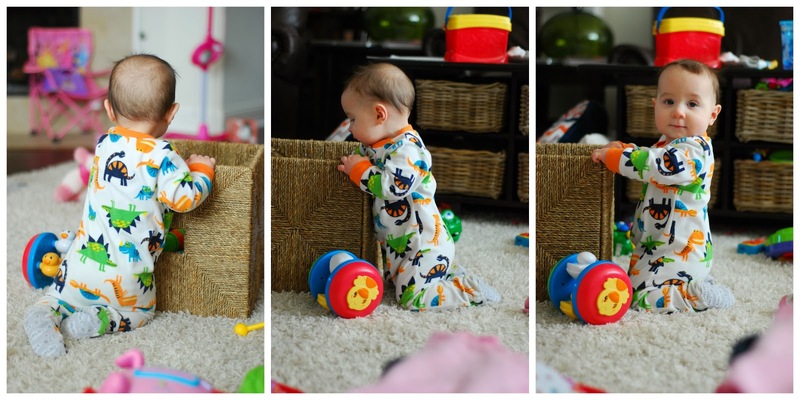 these next few are from earlier in the month when he was really wanting to crawl, but inadvertently just pushing himself backwards. 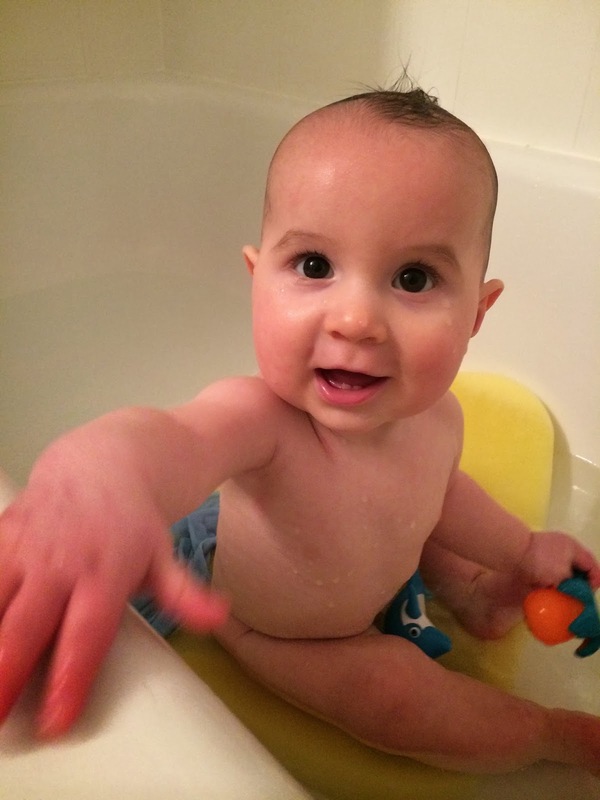 LOVES the bath! just splishes and splashes all around. 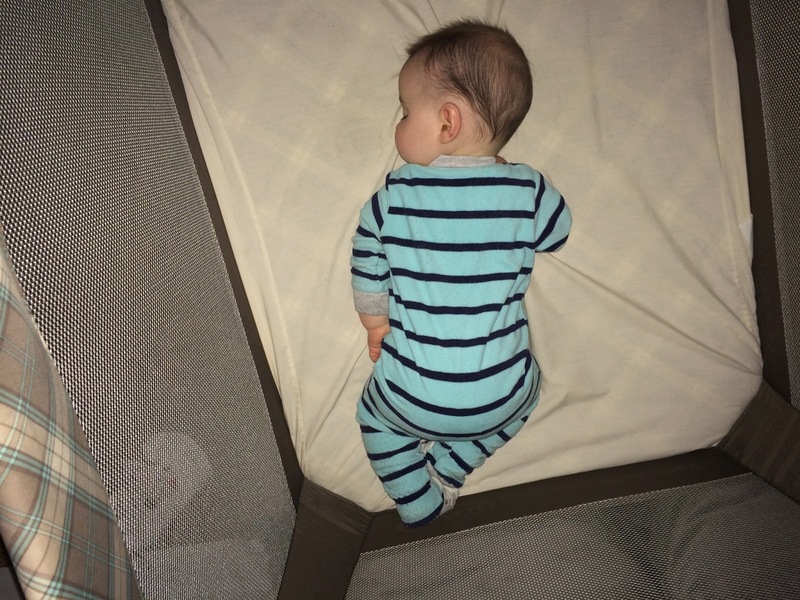 This was taken earlier in the month when I was still putting him in the pack-n-play in our room (not because I have attachment issues, but because he is still not sleeping through the night and I didn't want him to wake the girls). You can't leave him unattended!! Not even for a second! 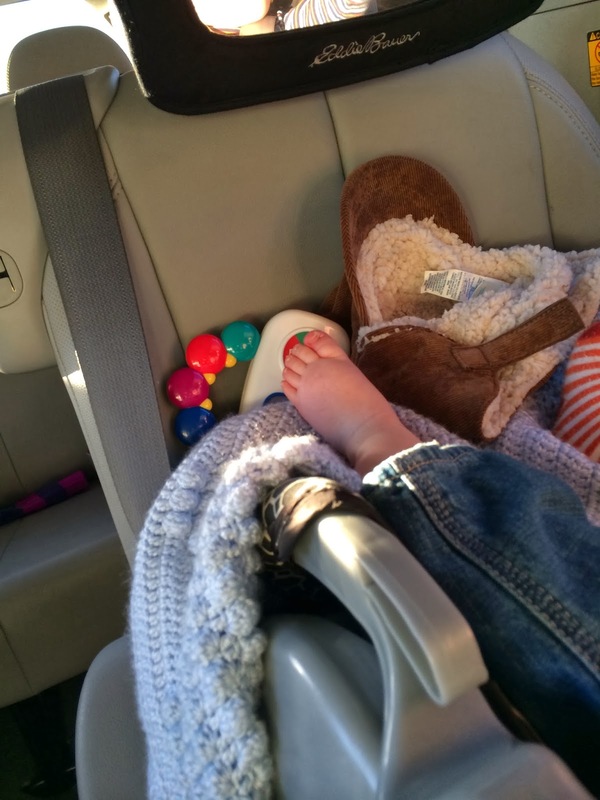 Little stinker likes to pull his socks off...and sometime when we're parked and I'm able to look back there...I see that sweet little chubby foot and I just can't stand it!! He's just the sweetest. Usually the picture isn't always this nice as he likes to be right in their business. This lasted a few minutes. This is a video taken just a few days after he first started crawling. Here- he still has his leg caught underneath him and we still had to give him things to be motivated to move. Markers seem to be pretty good motivation. IMG 0968 from Marla on Vimeo. 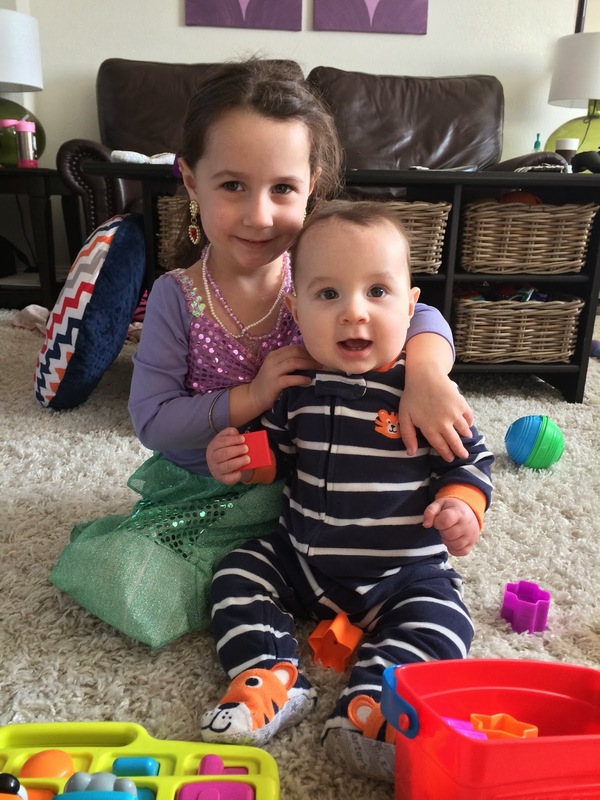 **He had his well-vist this past week and and I wrote about it all here. He is so cute and so very sweet! Time is going by so fast!